‘Pull Cord’ comes from a story I heard as a child about three witches who caused storms at sea. These witches tied knots in rope as a spell to create storms that ranged in severity from a light rain to a full-blown tempest. Each sequential knot in the rope would increase the storm’s power. ‘Pull Cord’ has three knots. The knots also, of course, reference the nautical term for speed. This 28 foot long hair rope indicates that the potential levels of storm at sea are beyond imaginable, becoming mythic in proportion. 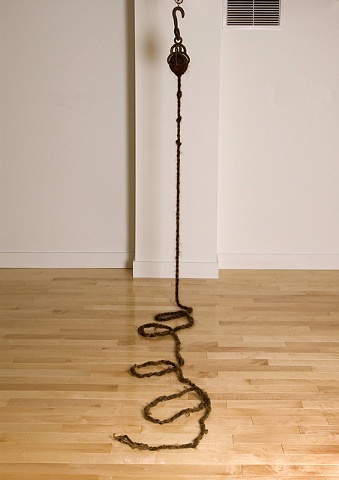 The first 14 ft of the rope consists of 42 plies of handspun human hair yarn, and the last 14 ft are made of dreadlocks stitched end to end in three cords and braided.